The wood from this bench is made of Pine. Not the usual Pine found growing in timber harvesting farms through. This pine has large distances between the knots and the growth rings are close together, which means it had “slow growth,” and is harder than Pine wood you can purchase today. As a tree grows and increases the circumference of its trunk, the growing trunk begins to overtake the branches that grow out from it. Knots form around these branches, building up trunk material as the tree continues to expand. If the knots are far apart and the growth rings are close together, it indicates this tree did not have ideal conditions on which to grow, but was a more hardy tree. During the years 1870’s-1880’s was the same time that pine dense virgin forests were being logged in the Upper Peninsula of Michigan and Northern Wisconsin, because the Great Lakes were the new areas of timber and the land and natural resources at this time, the wood from this bench is probably from the U.P. & N. Wisconsin. The timber supply in the Midwest was dwindling, forcing loggers to seek new sources of “green gold”. In the early decades of the 19th century, the Great Lakes and their tributary waterways flowed through areas densely covered with virgin timber. The pine was probably cut and floated along the shores of Lake Michigan to sawmills near Chicago. When the large logs reached their milling destination and probably shipped to Fort Wayne, partially by railroads, possibly by barges and then horses, because cars were only beginning to be created in 1886. The wood was rescued from a home built in Fort Wayne between the 1870’s-1880’s and then handcrafted by Save Maumee’s own, Brian Pyle. 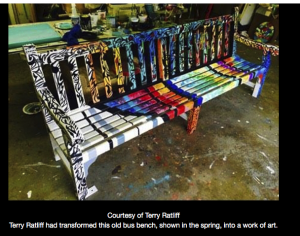 The bench will be replacing Terry Ratliff’s bench that was destroyed (Journal Gazette, August 24, 2016) and Rat Art will give it the flair and aesthetics that is expected in his world famous paintings. After it is painted, it will be potentially placed along the St. Mary’s River, within the Riverfront Development area scheduled to break ground in April 2017. The day the bench was completed, Save Maumee’s long time member and “light-worker,” Bill White passed away and his name was placed on the bench’s planter as a reminder that Bill still watches over the river he so vehemently worked to protect. 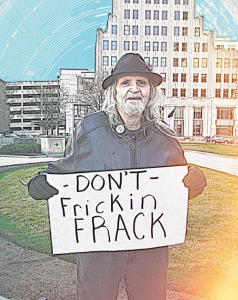 Click on Bill’s picture to see his 141 mile canoe trip, down the entire length of the Maumee River over 9 days…with Bill White’s story, as only filmmaker Terry Doran could capture. 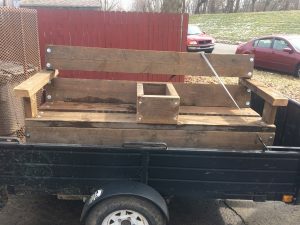 -Transportation of bench provided by Member Chris Hartleroad ~ to and from its handmade location (6 hours). -Potential bench’s home location – St. Marys River, near the Wells Street Bridge, within Riverfront Development area. -Given to Terry Ratliff to paint and replace his own beautiful bench that was destroyed by vandals last year. 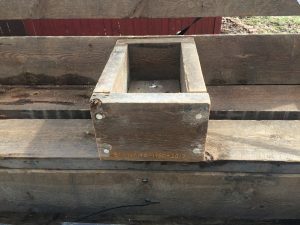 -The bench’s planter is dedicated to Save Maumee Member Bill White, who died February 7, 2017. The bench was placed in Heatherwood Park (Section 12) overlooking Trier Ditch.